The new StreamLine Mic enables hands-free audio streaming (phone calls, music, etc.) from any device with Bluetooth connectivity including all Android phones. The new StreamLine Mic provides full hands-free audio streaming of phone calls and music with any Bluetooth smartphone. It also works as a remote microphone and is compatible with Siemens Signia Nx hearing aids. And with Signia’s myControl App, StreamLine Mic can be remote controlled for maximum convenience. Only 2" X 1" X 1/2"
A pair of hearing aids that deliver the sound that nature intended. 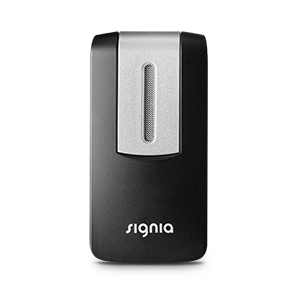 The new StreamLine Mic transforms Signia Nx devices into more than state-of-the-art hearing aids. They also become a hands-free mobile headset and wireless headphones that stream premium stereo quality from any Bluetooth device – mobile phones, PCs and laptops. A hands-free mobile headset for full convenience on the phone. Wearers can accept phone calls without having to take their phone out of their pocket. Even while streaming sound from their TV into their hearing aids via our StreamLine TV accessory, they can instantly take calls without having to turn off the TV sound manually. A pair of wireless stereo headphones with highest streaming quality. This is the ideal solution for all Signia Nx wearers who would like to stream phone calls, music, audiobooks and more, directly into their hearing aids from any Bluetooth device. A remote microphone for the best speech understanding in the most challenging environments. StreamLine Mic also functions as a remote microphone to help in challenging hearing situations, such as crowded meetings. Wearers can stream a speaker’s voice directly into their hearing aids from a distance of up to 20 meters. As a result, they hear the speaker as clearly as if he or she were standing right next to them.